WARNING: If you haven’t watched this episode, please be aware of spoiler from reading this article. If you do not want to see, please do not click the link “Read rest of this entry”. We welcome all the comments and please share your thoughts too about ‘Daebak’. Thanks. 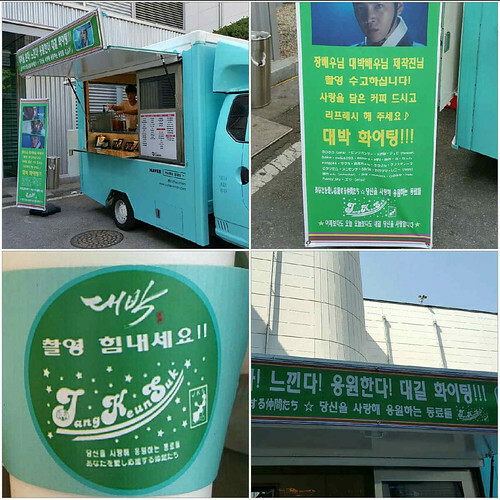 [Daebak support] This afternoon “Peers who love you and cheer for you” is supporting coffee truck!!! Actor Jang and ‘Daebak’ staff, please keep working hard, having coffee full of love!! [대박 서포트] 오늘 오후 커피차는 “당신을사랑해 응원하는동료들” 에서 서포트 하였습니다!!! 장배우님과 대박 스텝분들 사랑이 담긴 커피드시고 힘내세요!! Actor Jang Keun Suk photos from the filming location have been released. Photos of Jang Keun Suk at filming location of the SBS Monday/Tuesday drama ‘Daebak’ were published on the 2nd (June). We can see Beak Dae Gil`s (Jang Keun Suk´s role) disarming sincerity and cheerful face. According to the video, JKS seems to become one of the new endorsers for Shang Hui and was invited to attend Shang Hui international 15th anniversary celebration on June 6th, 2016. That means Sukkie will fly to China tomorrow? Let’s wait and see!